About a year and a half ago at the Torrance branch of Mitsuwa Marketplace, L.A. got to meet the full-blown food craze known as the Original Ramen Burger. Born in Brooklyn, the burger with a beef patty sandwiched between two cooked coils of ramen buns was created by Keizo Shimamoto and brought to Torrance as well as Pasadena for an extremely limited weekend engagement. More than 1,000 fanatic foodies stood in line at the Torrance pop-up for a chance to score one of only 500 burgers. 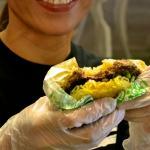 Since then, life for the Original Ramen Burger hasn’t slowed down much. At Brooklyn’s Smorgasburg food market, the queue for the Ramen Burger is still the longest, with the burger selling out every time. Even at its permanent Los Angeles outpost in Koreatown, located next to Lock & Key lounge, Ramen Burger sales are brisk but, luckily for us, without the crazy lines. 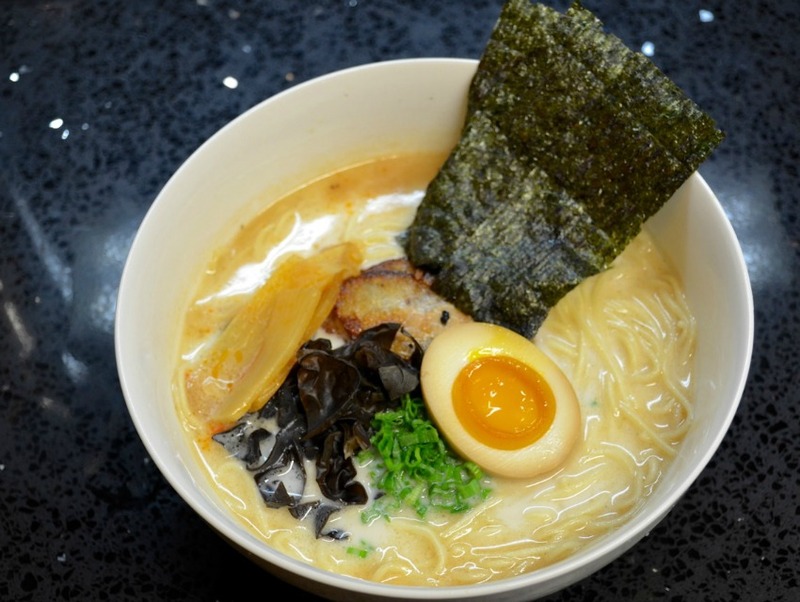 Shimamoto, a resident of New York, also established a brick-and-mortar shop in Manhattan called Ramen.Co where there are Ramen Burgers along with actual bowls of ramen. And last Friday, L.A.’s Original Ramen Burger stand debuted its limited-run ramen bowls in Koreatown. They’re available Friday and Saturday nights from 10 p.m. to 2 a.m., or until 50 of each are sold out, which already happened on the first weekend. With creative consulting by Shimamoto and execution by Devin Hight, who is also the Original Ramen Burger’s general manager, there are two ramen bowls being served: a tonkotsu-shio and torigara-shio. For the tonkotsu, an entire pig’s head is rapidly boiled for 24 hours to achieve the proper fat emulsion for a rich and creamy broth. (As an aside: I also recently experienced pig-head tonkotsu at the Ramen Yokocho Festival and Championship; hopefully this trends.) A powerful profile of garlic is contributed by freshly roasted garlic ma-yu (oil). Toppings include sous-vide chashu, sake, chili oil-infused menma (fermented bamboo shoots), kikurage mushrooms, marinated egg, scallions, and nori. Straight, thin ramen noodles are used for this bowl. 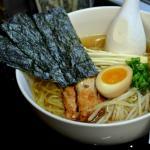 As a tonkotsu freak, I was surprised to find myself favoring the torigara, a chicken-broth-based ramen. Free-range chicken bones are simmered for 13 hours. Upon service, a niboshi dashi made with dried baby sardines, kombu, and shiitake is mixed in. Enoki mushrooms, chashu, marinated egg, green onion, nori, and bean sprouts pile above the soup and noodles. A gently wavy noodle helps deliver the broth to your mouth. It’s nice to witness a food frenzy settle down and find its place among everyday menu options. The Original Ramen Burger continues its maturation by making hearty bowls of ramen, which can warm anybody’s heart and stomach.